Most of the action, of course, happens far from the madding crowd of the Westin St. Francis Center Camp at innumerable hosted encampments throughout Union Square. There, the vibe is decidedly different. Novel therapies for human diseases have been getting approved at a historic rate (46 drugs approved by the FDA in 2017 – the most in 20 years). On the pipeline front, the creative verve that launched the biotech industry in San Francisco during the 1970s has never been more evident. The number of compelling early-stage compounds that could address unmet medical needs is in the hundreds, if not thousands. I know some folks who attended the adolescent years of the Conference that don’t bother to show up at all anymore. For them, there is a sense of Paradise Lost. Yet among the growing tribe that return in record numbers every year, there are feelings of hope and optimism about the industry. 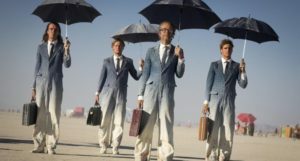 The reality is that the J.P. Morgan Healthcare Conference, like Burning Man, is just coming of age. It is more relevant than ever, and the best years are still ahead.